My world is encased in ice, preschool is canceled, my daughter found some unwrapped Christmas gifts, & I've just discovered my garage refrigerator isn't working. I've tried flipping every breaker and GFI switch I can, and the problem remains. All that was once frozen, is now thawed. Which is ironic isn't it? My front yard isn't supposed to be frozen, but it is. My frozen goods, are mush. Hmnn.... What's for dinner?? 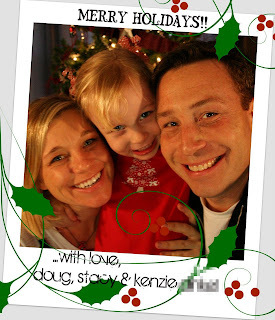 I also spent a great deal of time making this little image (minus the pixelated last name) for my Christmas card, only to discover that it does not print correctly as a 4x6". As result I'm feeling a bit scrooge-like . Fortunately we have things like this to entertain us. Turning my family into elves is fun. And, heck I even get to look skinnier!! Okay, if you skipped the links...go back to scrooge and elf your own family! stay warm and safe, cute little family! Isn't making Christmas cards just so much fun? I've been hearing about all the ice your way - yuck! We finally got a little thaw. My children had resorted to going down a driveway on their rear ends to wait for the bus! Great family photo. You and your husband have very similar smiles. I am sure you are able to stay warm (I was always sooo hot when I was pregnant) with your own mini-furnace, hope your family stays toasty too.